Aiseesoft MTS Converter 9.2.22 Free Download - Convert MTS and other popular video/audio files to any video and audio format. Aiseesoft MTS Converter owns powerful encoder and decoder technology to convert MTS, TS, M2TS, and popular video/audio files to any video(AMV, ASF, AVI, DivX, Flash H264, H.264 AVI, FLV, SWF, H.264/MPEG-4 AVC, M4V MPEG-4, MKV, MOV, MPEG-1, MPEG-2, MPEG-4, MTV, VOB, WMV, XviD, DV, VCD, WebM, HD video) and audio(AAC, AC3, AIFF, AMR, AU, M4A, MKA, FLAC, MP2, MP3, OGG, WAV, WMA) format. Moreover, it supports iPhone XS Max/XR/X/8/7 6s/6s Plus/6, iPad mini 3/2, iPad Air 2, iPad Air and Samsung Galaxy Note 5, etc. 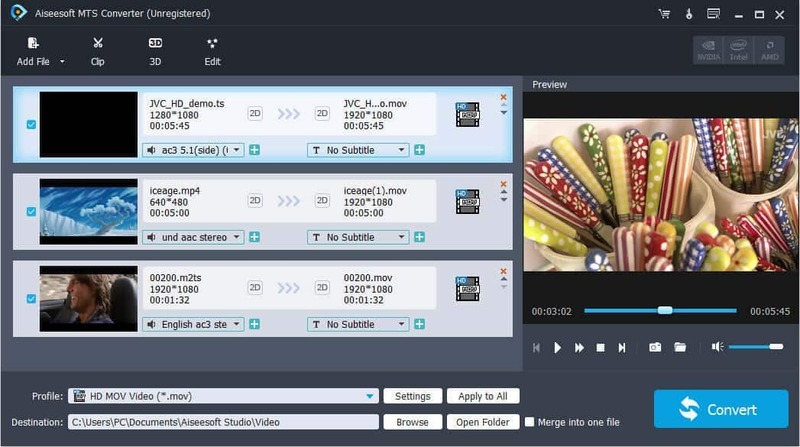 It can convert MTS and other video/audio files to the video format of AMV, ASF, AVI, DivX, Flash H264, FLV, SWF, H.264 AVI, H.264/MPEG-4 AVC, DV, MKV, MOV, MPEG-1, MPEG-2, MPEG-4, MTV, VOB, WMV, XviD, VCD, WebM and HD or audio format of AAC, AC3, AIFF, AMR, AU, FLAC, M4A, MKA, MP2, MP3, OGG, WAV, WMA. Choose multiple output formats for the source video/audio, and you will get multiple output video or audio formats at the same time. You are allowed to define the output video and audio parameters, such as Video Resolution, Video Bitrate, Frame Rate, Encoder and Audio Channels, Sample Rate, Encoder, Audio Bitrate as well as video Brightness, Contrast, Saturation, Hue, and Volume. Personalizing your video with the image or text watermarks can be realized either. Unwanted playing areas of a video can be cut out so as to fit your different portable players. you can also rrim a video or audio to your desired time length segments by setting the start and end time. Merging several video or audio files into one is a piece of cake. The output files can be played on: iPhone X/XR/XS Max8/7/6s/6s Plus/6/5S/5C, iPhone 5, iPad mini 3/2, iPad Air 2, iPad Air, ipad 4, iPad mini, iPod touch 5, iPod nano 7, Samsung Galaxy S4, Samsung Note 5, HTC One X and Kindle Fire HD, etc. Statement: First, please download the orginal installation package by clicking the download link. Of course you may also download it from the publisher's website. Using Aiseesoft MTS Converter crack, key, patch, serial number, registration code, keygen is illegal. The download file hosted at publisher website. We do not provide any download link points to Rapidshare, Hotfile, Depositfiles, Mediafire, Filefactory, etc. or obtained from file sharing programs such as Limewire, Kazaa, Imesh, Ares, BearShare, BitTorrent, WinMX etc. Software piracy is theft. If you like Aiseesoft MTS Converter please buy it.